That might just be a taster of the final to come. And if it is, what a treat that will be! Australia met South Africa for dominance of Group A, both teams already through to the Super 8s round, with the points from this game carrying through to that stage of the competition. Australia opened the batting and immediately made it clear they meant business, clearing 50 inside 5 overs. 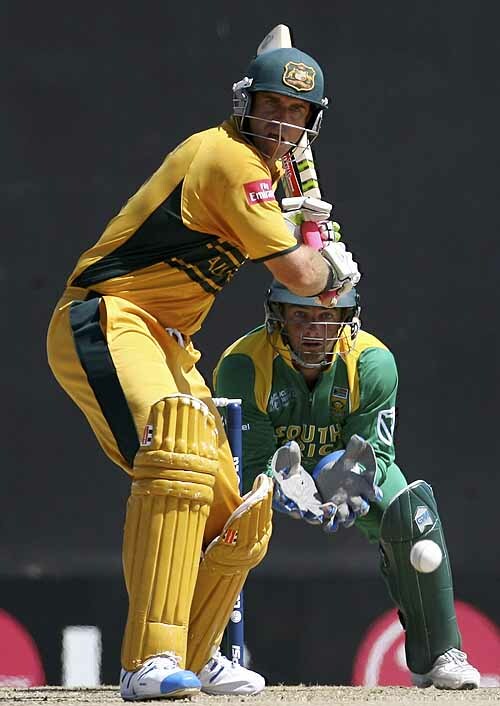 Matthew Hayden looked to be on stellar form as he scored the fastest century in World Cup Cricket, off just 66 balls, a dangerous omen for the other Super 8 sides. Despite immediately thereafter succumbing, for a total of 101, Hayden’s tally was bolstered by near centuries from Michael Clarke (92) and Ricky Ponting (91) as well as a sound 42 from opening partner Adam Gilchrist, for a total of 377 for 6. An impressive total no doubt, but Australia have had a reputation of late for being unable to defend their targets. South Africa looked to be up for the challenge, with an impressive opening partnership between AB de Villiers and Graeme Smith for 160, stopped only by an extraordinary run out, thrown directly from the outfield. The run rate slowed visibly after de Villiers’ dismissal, and Smith eventually retired with cramp (albeit with a brief return to the field, only to be almost immediately caught behind in the later stages). Tait pulled an important haul for Australia to wrap some of the danger men, and put an end to any South African hopes of victory. But does anyone else wish he’d stop grunting? If Hayden and co. can stay in the form they’re in, the latter stages of this competition can only go one way. South Africa are not out of it yet, of course, and both they and Australia will join the West Indies, Ireland, New Zealand, England, Sri Lanka and presumably Bangladesh for the Super 8s. A handy 2 points from this meeting will leave them in confident mood to face the hosts in Antigua next Tuesday.